This picture, which appears in Byrne Fone's book Historic Hudson: An Architectural Portrait, shows the elevated railroad track going east and west through the South Bay. This is the railroad that ultimately became what is known today as the "causeway." The groundbreaking for this railroad on piles took place in 1874, but it wasn't completed until 1889. Unfortunately, the elevated track was not a success. The South Bay apparently has a "bad bottom" that could not support the trestle, so it was very soon filled in. As I said earlier, the river is not just our heritage but also our future. Quite literally so in terms of the improvements this riverfront has witnessed in just the past five years, and, most excitingly, in terms of the community-planned development that will follow in the next five years, and beyond. While reminding us of the past, this great Quadricentennial can give us glimpses into the future and point to creative new windows of opportunity. For instance, just imagine that instead of being here for only a few days, the Half Moon had good reason to spend more time here--coming and going, as if from a home port. Imagine one of the slips on the Henry Hudson Park grounds being reengineered to comfortably accommodate historic vessels like the Half Moon. Imagine the old brick warehouse building there, just across Water Street, as the Henry Hudson Maritime Museum, a perfect land-based complement to the floating museum that is the Half Moon. And, finally, imagine what something like this could mean for Hudson and its waterfront: a powerful new magnet for tourism, education, recreation, investment, commerce and quality-of-life. Just an idea, born of the river . . . that always has been and always will be a key to our future. At the Common Council Legal Committee meeting on Wednesday, City Attorney Jack Connor reported that ownership of the Washington Hose firehouse is definitely a requirement if HDC (Hudson Development Corporation) is to carry out its plan to rehabilitate and reuse the building as a visitor information center, office space, and a conference room/training center. (See New Plan for Washington Hose below.) Connor also reported he was having difficulty finding the deed that transferred the land on which the firehouse stands from the Proprietors to the City of Hudson. He speculated that, since the incorporation of Hudson in 1785 preceded the establishment of Columbia County by one year, the deed might be in the archives of Albany County, of which Hudson was part until Columbia County was established in 1786. While Connor seems to be busy trying to enable the transfer of ownership, it remains that any sale--or, in this case, gift--of city-owned real property must be approved by a three-quarters majority of the Common Council. Back in 2008, a coalition of First and Third Ward aldermen--called by some the "Gang of Four"--blocked the sale of Washington Hose to Charles Davi on the conviction that the building, because of its strategic location at the entrance to historic Promenade Hill, was far too important to the City's vital connection to its waterfront to allow it to pass into private hands. Transferring ownership to HDC would not be significantly different. HDC, as Third Ward Alderman Ellen Thurston observed at a recent meeting of the new Economic Development Committee, is what the British call a quango--a quasi-autonomous nongovernmental organization. Although four city officials--the mayor, the Common Council president, the majority leader, and the minority leader--sit on the HDC board, HDC does not answer to the City. Were HDC to own Washington Hose, the City would not have significantly greater control over its future than if it had been sold to Davi. The question is: Will there be enough votes on the Common Council to block the transfer to HDC? With two new aldermen--Sarah Sterling and Geeta Cheddie--representing the First Ward, it cannot be assumed that the "Gang of Four" will again stand fast to prevent the deaccession. However, there is some sense that the City is not happy with Markou's expectation. Treasurer Eileen Halloran, who supported the sale to Davi because the City had made a commitment to sell the firehouses to pay down the debt on the Central Firehouse (curiously, no one talks about that anymore), has expressed opposition to the transfer of ownership to HDC. At the Legal Committee meeting, Cheddie questioned the reasonableness of the City contributing $50,000 from its fund balance to rehabilitate the firehouse and then giving it away. A better solution would be for the City to give HDC a long-term lease on the firehouse, similar to the leases that the State of New York has with various historic preservation groups on state-owned historic properties, among them the Plumb-Bronson House. Under the terms of such a lease, any rent paid by HDC to the City could be nominal, but the lease would give HDC an ownership interest in the building and could, if so agreed, allow them to recoup some of their investment by, for example, charging rent to the Chamber of Commerce, who, according to the plan, would occupy part of the building. The important thing is that the City would continue to own the firehouse and to control what happens to the building and the site. I went to the Greenport Planning Board meeting on Tuesday night, as did others—Patrick Doyle, Ellen Thurston, and Christopher Reed—with an interest in the O&G/Holcim plan to use the old railroad bed from the quarry to the waterfront as a truck route. There's a report about the meeting by Mike McCagg on ccSCOOP, but there are a few things not included there that should be mentioned here. I think it's fair to say that the Greenport Planning Board doesn't seem entirely pleased with the proposal before them, and Planning Board member Michael Bucholsky is most vocal in his concerns. He's worried about heavy truck traffic crossing the major thoroughfares into Hudson from the south. He's worried about protecting the Town of Greenport's aquifer. He's worried about the proximity of the proposed industrial road to the new high-tech fish farm, Local Ocean. It had been speculated that at Tuesday's meeting the Planning Board would determine that the O&G/Holcim application was complete and schedule a public hearing. But they didn't. Instead they asked them to come back next month with current traffic counts for Route 9 and Route 9G, a better explanation of the proposed road itself, and some indication of the impact heavy truck traffic might have on the aquifer. Some interesting information surfaced during the course of the meeting. For one thing, O&G/Holcim seems to have upped the number of the trucks that will use the route. I seem to remember the number being 70 loads a day. On Tuesday night, O&G's Patrick Prendergast spoke of 80 loads a day--14 trips per hour made by seven drivers in seven trucks. He said it takes two days of this level of activity to load a barge, implying that the route would only be used when there was a barge at the deep-water dock. He also indicated that hauling aggregate did not occur in winter, which struck me as somewhat disingenuous since only a few days earlier, while walking my dog in the early morning, I had witnessed from the PARC Park on Warren Street two huge dump trucks, such as those used for hauling gravel, heading west on Columbia Street, one right behind the other. And not just the number of trucks but the size seems also to have increased. After making reference to tractor-trailers and being called on it, Prendergast admitted that a "mix" of vehicles would be used--both dump trucks and tractor-trailers. We also learned a little more about the road itself. From 9G east, it will be two lanes, each lane 12 feet wide, with shoulders. (The picture accompanying this post shows the "road" heading east from 9G as it is today.) Going west from 9G, through the South Bay along the "causeway," it will be one lane "with turnouts." One wonders what etiquette will govern which truck--loaded or empty --has the right of way. There was also some interesting mention of Hudson at the meeting. Don Alger, chair of the Planning Board, said that he had met with the mayor and "his staff." (Who, beyond Cappy Pierro, constitutes the mayor's staff?) Algers acknowledged that there were "citizens who don't want this," but Prendergast countered by saying that BFJ "considers it one of the better routes." The board concluded that they are interested in "opening up communications with the City of Hudson." 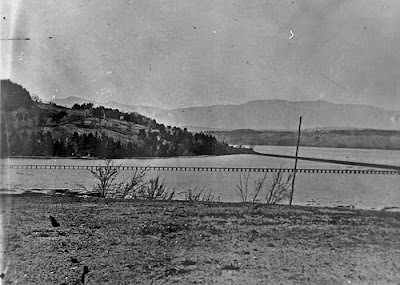 On the subject of moving aggregate from the quarry to the river, a friend pointed out recently that all the arguments and counterarguments of today are the same as they were back in 1874 when the people of Hudson had to put up with wagons hauling stone through the city from Becraft Mountain to the river. The problem, he concluded, was that the limestone deposit is in the wrong place. So it would seem. On the other side of the river, cement companies have given up on major limestone deposits because the New York State Thruway was built on top of them. I guess the existence and well-being of our little city falls short of representing the same level of hindrance. In August 2008, Peter Jung announced the discovery of the grave of Hudson River School painter Sanford Robinson Gifford in the Hudson City Cemetery. The announcement was just a wee bit misleading. The "discovery" had taken place five years earlier, and many of us already knew that Sanford Gifford was buried in Hudson and had even visited his grave, thanks to Don Christensen, who in 2003 put together a magnificently well-researched tour of places in Hudson related to the life of Sanford Gifford and other artists who were his contemporaries, to coincide with a major retrospective of Gifford's work at the Metropolitan Museum of Art. Jung's discovery of the grave inspired him to undertake a project, with art historian Alexandra Polemis and art enthusiast Paul Stein, to restore the family plot where Sanford Gifford and his wife, Mary, are buried. To this end, a restoration plan has been created and a professional stonemason has been identified to repair and reset the tombtones. All that remains is to raise the needed funds. The cost of the project has been estimated to be between $10,000 and $15,000. So far, $6,500 has been committed. The restoration could begin this spring if the remainder of the money can be raised. To this end, a handsome blog was been created, where you can learn more about Sanford Gifford and his work and make a contribution to the cause. 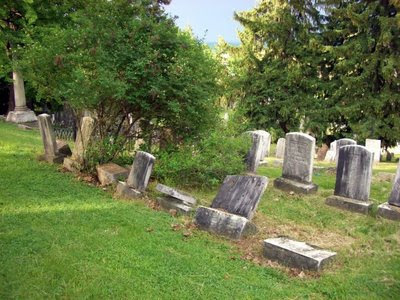 In the 1980s, the New York State Historic Preservation Office determined that the Hudson City Cemetery was eligible for listing in the National Register of Historic Places for its notable collection of late 18th- and 19th-century funerary art. This status was confirmed by William Krattinger of SHPO in 2005. As a community, we should pursue National Register designation for our cemetery, and restoring the grave of one of the cemetery's most illustrious personages should be the beginning of that effort. On a cold Monday night a couple weeks ago, a group of stalwarts gathered at the Hudson Opera House for a meeting organized by Sustainable Hudson Valley (SHV). The purpose of the meeting, as SHV Executive Director Melissa Everett defined it, was to "sound an alarm about climate change" and "seed an idea." It was a meeting in two parts. In the first part, Barbara Ettinger and Sven Huseby, creators of the film A Sea Change (and, of course, Two Square Miles), talked about their experiences in Copenhagen at COP15. What I found most compelling (and, as a "gossip" instead of a reporter, I get to use the first-person singular) was not what they had to say about the conference but what they said about the experience of being in Copenhagen. More than thirty years ago, as a consequence of the 1973 oil embargo, Denmark, after a three-year debate, made the commitment to sustainability. Today, Copenhagen is the model of sustainability. Ettinger talked about the preserved architecture of Copenhagen and about the bicycles of Copenhagen. 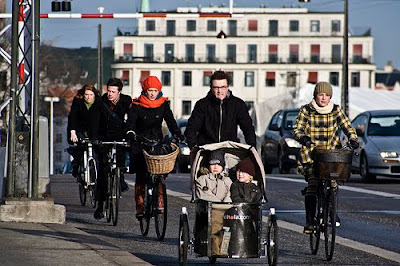 Fifty-five percent of the people in Copenhagen cycle to and from work--and that includes tradespeople, such as electricians and plumbers, who carry their equipment on specially designed tricycles that have the two wheels in the front and the single wheel (and the steering mechanism) in the back. The design creates "cargo space" in front. For plumbers and electricians, this space is used for tools and supplies. For others, it's used for groceries, children, and/or dogs. Ettinger told how when it snows--as it did while they were there--the snow plows clear the bike lanes before they clear the roadways for cars. Sounds good to me. In the second part of the meeting, Michael O'Hara, Director of Operations for SHV, held out the possibility of Hudson becoming a little Copenhagen. He proposed that Hudson accept the challenge of "10 Percent in 2010"--that is, that there be a concentrated campaign in Hudson to reduce carbon emissions--both individual and municipal--by 10 percent in the next year. O'Hara clued the audience in to Earth Aid, an online service that lets you track your energy usage. He also told about Bedford, NY, where the municipality took a bond to create a fund for energy-reduction improvements. Individual property owners could borrow from the fund to finance the installation of solar panels, individual wind turbines, or whatever, and their repayment would become part of their property taxes. The enabling legislation for such programs has already been passed by the New York State legislature. On the municipal level, the idea was that the City of Hudson make a commitment to reducing its energy consumption by 10 percent in 2010. In pursuit of this, O'Hara was going to make a presentation to the Hudson Democratic Committee the next night. Hudson is, after all, controlled by Democrats. The mayor, the treasurer, the Common Council president, and nine of the ten members of the Common Council are Democrats--albeit Democrats of very different stripes. The word is that meeting was very successful. Common Council President Don Moore reported that "the buzz is growing and looks genuine." Victor Mendolia, chair of the Hudson Democratic Commmittee, reported that Hudson elected officials had an informational meeting today--January 25--at Solaqua to learn about the requirements for Energy Efficiency Block Grants (part of the federal stimulus package) and to talk about which city buildings might be good candidates for the grant. The deadline for applying for Energy Efficiency Block Grants is February 17. The progressive degradation of the South Bay began with the railroad transecting the mouth of the bay in the mid-nineteenth century. 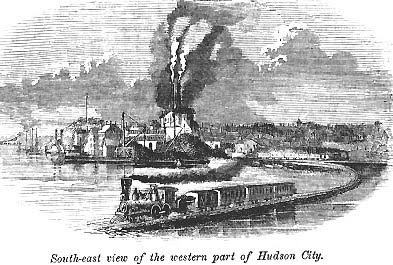 For more than half Hudson's history, the railroad has been a part of the waterfront, and in his comments at the LWRP public hearing, Patrick Doyle suggested a way that this part of Hudson's heritage might be commemorated. 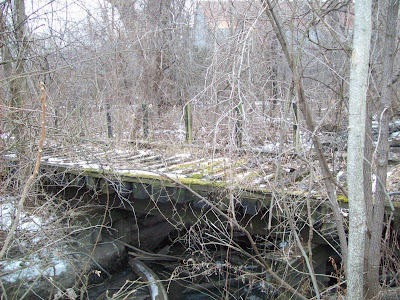 There is a railroad trestle across one of the embayments at the waterfront--the only surviving bit of a spur that once went down closer to the river, possibly to the old gasification works. Doyle's suggestion is to restore the trestle, which is in remarkably good condition, move an antique railroad car onto the trestle, relocate the antique railroad crane that now sits across the street from the train station to the site, and create an outdoor railroad museum. Rather a nice idea. At one time, there was talk about turning the current site of the crane into a sculpture park. A few years ago, Tom Swope nominated the crane for local historic designation, but that effort was sidetracked by city attorney Cheryl Roberts, who maintained that an object could not be designated separate from the land on which it stands, and the idea of designating the site or any part of it seemed to present insurmountable problems. Doyle's idea would be a good way to consolidate and protect these two vestiges of the past on our waterfront. In my report on the LWRP public hearing, which follows, I make reference to Alternative 3B Nuanced--Hudson's own "public option": a public road from Route 9G to the waterfront. This map shows the route of this public road. On Wednesday night, the public hearing on the draft LWRP (Local Waterfront Revitalization Program/Plan) and GEIS (Generic Environmental Impact Study) was held at John L. Edwards School. The turnout was estimated by one attendee to be about 150, but only ten people signed up to speak. Since the Common Council is the lead agency for the LWRP and will ultimately make the decision to adopt it, comments at the hearing were addressed to the Council, whose members were seated at the front of the room--except for Fifth Ward Alderman Bob Donahue, who chose to sit not with his colleagues on the Council but with the mayor in the audience. Among the ten speakers was a representative of the Hudson Power Boat Association who expressed concern about the expense of realizing the plans for the waterfront outlined in the LWRP. He talked about the declining population and declining tax base in Hudson and urged that a feasibility study be done before a position for a harbor master was created. There appeared to be a large contingent of representatives from the Fugary Boat Club, the settlement of sporting shacks at the north end of Front Street, but they had designated one person to speak on their behalf. He appealed to the Council to let the Fugary Boat Club stay. Claiming that the squatters' settlement is "documented to have been there for a hundred years," he predicted that its destruction would be as great a loss to Hudson's heritage as the demolition, in the late 1960s, of the General Worth Hotel. There was also a spokesperson for Hendrick von Ritter, who has an ongoing lawsuit against the City of Hudson, blaming the City for the flooding that occurs on his Tanners Lane property during major rain events. The spokesperson said that von Ritter is opposed to rezoning his property and warned that if the new zoning of the Waterfront Revitalization Area is adopted before the litigation is resolved, von Ritter will seek an injunction against the City. The other seven speakers--Elsa Leviseur; Patrick Doyle, owner of Basilica Industria and unofficial "sheriff of the South Bay"; Peter Jung; Christopher Reed, board president of Friends of Hudson; Hilary Hillman; Mark Wildonger, planner for Scenic Hudson; and this writer--made statements that shared, with variations, a common theme: a private road through the South Bay for heavy gravel trucks is not a good idea. 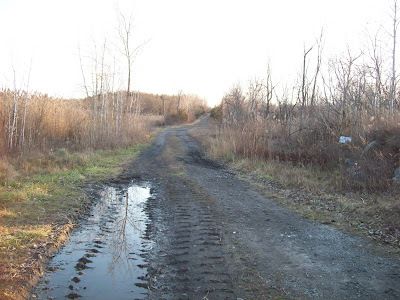 Some called for a hydrology study to be completed before any kind of road through the wetland is considered. Others stressed the scenic and recreational possibilities of the South Bay and its potential to help with storm water management. All advocated for a new route to the deep-water dock for gravel trucks that avoids both the residential neighborhoods and the South Bay, and some--this writer among them--supported specifically a public road to the waterfront that is being called "Alternative 3B Nuanced," making reference to the designation of alternatives to the "causeway" route identified in the GEIS. 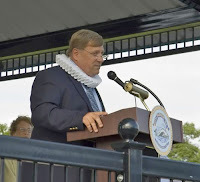 Several of the speakers made reference to last summer's Namesake Celebration, Hudson's very successful Quadricentennial event, and called for a committed effort by the City to make Hudson the home port of the replica Half Moon and turn the old warehouse building across from Henry Hudson Riverfront Park into a maritime museum celebrating the history of Hudson and the Hudson River, an idea put forward by Mayor Scalera in his speech at the dedication of the park in July 2009. In commenting on the proposed new zoning, Leviseur suggested that there should be an "arts overlay," which, similar to the inclusionary zoning being proposed for the current site of Hudson Terrace requiring that 10 percent of any new development be low-income housing, would designate areas within the Waterfront Revitalization Area where 10 percent of any new development would have to be set aside for artists' studios. In his statement, Reed made the point that finding the best solution should always be the first step; dealing with obstacles comes second. In contrast to this, Scalera focused on the obstacles when he was quoted in the Register-Star as saying that Alternative 3B Nuanced was not a viable alternative because "L&B’s current owner . 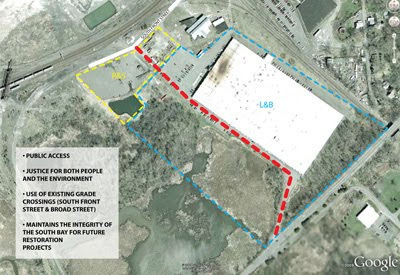 . . said to obtain the area proposed in the alternate public road the city would have to buy the whole property at $5.9 million." Acquiring the right of way for a public road that will benefit the entire community in multiple ways seems a worthy, legitimate, and compelling use of a municipality's right to exercise eminent domain. The period for submitting written comments on the LWRP and GEIS has been extended to March 15, 2010. Comments should be directed to the Common Council and mailed or submitted to City Hall, 520 Warren Street, Hudson, NY 12534. The draft LWRP and GEIS can both be downloaded at the City of Hudson's website. Last night at the first regular monthly meeting of the Common Council for 2010, a new plan for Washington Hose Firehouse, located at the base of Warren Street and the entrance to Promenade Hill, was presented by Peter Markou, Executive Director of HDC (Hudson Development Corporation) and HCDPA (Hudson Community Development and Planning Agency). HDC will rehabilitate the building, which is designated a historic landmark whose architectual integrity is protected by the Historic Preservation Commission, and occupy it in partnership with the Columbia County Chamber of Commerce. Kate Johns is the architect for the project, which is anticipated to cost $300,000. Markou expects the funding for the project to come from three sources: $150,000 from HDC; $100,000 from the Empire Zone; and $50,000 from the City of Hudson. HDC, HCDPA, and the Chamber of Commerce will share the space in the rehabilitated building. HDC and HCDPA will have their offices on the second floor; the Chamber will have its office and a visitor information center on the ground floor. The truck bay will be converted into a conference room/training center which can function as a incubator for entrepreneurial businesses. Markou also anticipates a "festival marketplace" in the open space just south of the building, with fair weather businesses run from pushcarts. Some familiar phrases were used by Markou when describing the project. He called Washington Hose "the anchor to the lower end of Warren Street" and "the gateway to the waterfront"--the same language used by the four aldermen who blocked the sale of the building to Charles Davi last year and were vilified for it. Last night, however, there were no disparaging words. Everyone seemed to embrace the idea enthusiastically. Mayor Scalera pointed out, however, that the Empire Zone committee was "lukewarm" about funding the project and suggested that people call their county supervisors and Board of Supervisors chair, Roy Brown, to urge them to support the idea. Some questions from the aldermen drew out useful and interesting information. Sarah Sterling (D-First) asked if the farmers' market could be moved to the area beside the firehouse. In answering this question, Markou mentioned the fact that city will soon own what he called the "River Loft Holdings"--the site of the two recently demolished factory buildings and the one remaining building on North Front Street that belonged to Bentley Meeker. This, Markou suggested, would be the perfect place for the farmers' market, and the surviving building could house a year-round farmers' market. Geeta Cheddie (D-First) asked if any part of the project would produce revenue for the City of Hudson. In answer, Markou spoke generally of the benefits of new small businesses fostered by the incubator and increased tourism stimulated by the visitor information center strategically located close to the train station, but Cheddie's question seemed to want a more specific answer. When the idea of leasing the building surfaced, Markou said disdainfully, "I'm not paying $300,000 to fix up the building and then have to pay rent to the City." Later on in the discussion, it was revealed that HDC wants the City of Hudson to convey the property to them. In view of HDC's expectations, it's interesting to recall that the not-for-profit Historic Hudson, whose proposal to lease Washington Hose was rejected out of hand by the majority of the Council last year, offered to pay rent to the City while using their fundraising and grant potential and their expertise to stabilize and restore the building, which would continue to belong to the City. Still, the HDC proposal achieves important things. It ensures the survival of the historic firehouse and promises to strengthen the connection between Warren Street and the waterfront. In the end, Common Council President Don Moore declared that he thought the plan had the complete support of the Council. It remains to be seen if the idea of giving the building to HDC--an agency of the City but not a part of city government--has the Council's support.